From craft production to industrial production. From these lines, written in 1308, it is possible to understand that already at the beginning of the fourteenth century the Arsenale had reached levels of organization and production out of the ordinary for the time. The Venetian Arsenale's ability to mass-produce galleys on an almost assembly-line process was unique for its time and resulted in possibly the single largest industrial complex in Europe prior to the Industrial Revolution. The Arsenale (Arzanà) was founded at the beginnig of the '200 as a municipal facility for storage and preservation of materials intended for commercial fleet. Further enlarged starting from 1473, the Arsenal is intended, as well as to manufacture and arming a merchant fleet, also to build and maintain in a sheltered place a reserve of ships (50 to 100 galleys) with which to face any eventuality. After the appearance on the seas of the new Turkish fleet, Venice equipped itself with a secret fleet, consisting of a great number of ships, disassembled, but ready to use in a few weeks. About 25 of these secret ships were always ready in dock, armed and equipped in order to be put into the sea within a few hour. The rest of the ships (25-50 galleys) was partly held in full dry hulls and superstructures and ready to be launched after the caulking. Another part of the Venetian fleet (50 galleys and many other light ships) consisted of complete structures of prefabricated ships to assemble and install in a few weeks. - maximum use of the micro-professionalism. The production process, however, was considered as a matter of exclusive competence of the people in the trade, framed within the Guild and left free to refer to the traditions and practices of their profession. The individual parts of the ship (masts, flagpoles, benches, tables, oars, ropes, etc..) were produced separately - but according to the same measures and models - in various workshops and subsequently stored in the Arsenale. The materials were then stored in the individual stores (each material in a warehouse different) along a path defined rationally. To operate the assembly line was therefore required a certain standardization of components in order to have interchangeable parts. This technical requirement favored the gradual shift in the Arsenale of most of the work before spread outside in individual workshops. New hulls built in the Arsenale were firstly scrolled on logs or wheels; then they were put into water and, along the internal channels - according to a predetermined path - stopped before the various workshops (sawmills, slipways, etc.) to be assembled. The hulls are then transported in the Arsenale Vecchio, passing in front of a series of warehouses, to be equipped. Finally, the ships were passed from the Arsenale's basin to the Lagoon (through the water entrance) and launched directly after the last check by the masters of the Guilds. Although during the successive French, Austrian and Italian dominations attempts were made to adapt the site to new production requirements of vessels before and iron ships then, the Arsenale had already started to decline because it was no longer in a position to satisfy the needs of modern shipbuilding. During the nineteenth century the progressive abandonment of the wood in favor of the iron for the construction of hulls and of the wind’s propulsion in favor of the motor one determined, in fact, in a relatively short period of time, changes in the characteristics of the boats. In the military field the process of transforming in the shipbuilding was even more profound for the effects of the pressing succession of significant developments in the field of armaments. Production sites, shelter and maintenance of vessels naturally had to adapt to these changes. Even the Arsenale of Venice had to change, when, following the Veneto’s annexation to the Kingdom of Italy in 1866, it was decided that Venice would have to maintain the role of maritime military garrison of great importance. The decision was supported by the security guarantees that the Venetian settlement could offer, due to the lagoon’s natural topography and morphology, and by the advantage of already having a large arsenal. The project to extend and adapt the Arsenale, which was completed in about twenty years, included the introduction of spaces, buildings and equipment completely new and essential to the context of a modern arsenal. - docks for loading, unloading and equipping vessels. The nineteenth-century interventions caused a profound change in the Arsenale, not only to the functional aspects, but also with regard to the appearance of the complex. 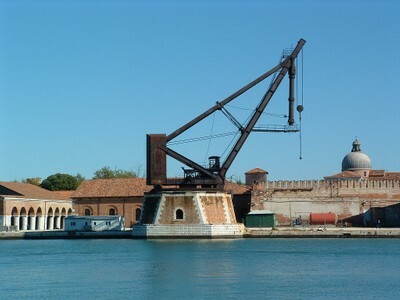 The adjustment of spaces and buildings was joined, in the Arsenale, by updating of equipment and machinery. Significant evidence of this updating process are lifting machinery: cranes in factories and warehouses and cranes of various sizes on the docks. Crane Larini Nathan (picture by C. Menichelli). Gooseneck crane Fairbairn, installed in 1874 (picture by C. Menichelli). Crane Armstrong Mitchell & Co. (picture by C. Menichelli). As regards the military shipbuilding, the use of iron for the construction of the boats’ hulls appeared already in 1822 in England, but it was only from 1855, with the introduction of the Bessemer process, which allowed the production of economic and large-scale steel, that the adoption of metal hulls began to have some relief, until it became predominant since 1875, with the introduction of the Siemens-Martin, which allowed to produce consistent and quality molten steel. In Venice the first realization of a modern battleship was the Francesco Morosini. The battleship Francesco Morosini, started in 1885 and concluded in 1889 (picture from Rivista Marittima, 1989, vol. I). 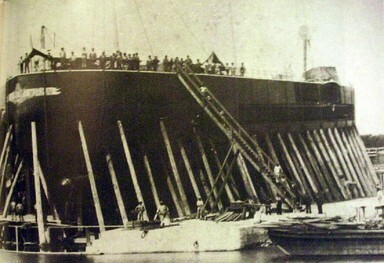 During the 900, however, the shipbuilding in the Arsenale underwent a halt.